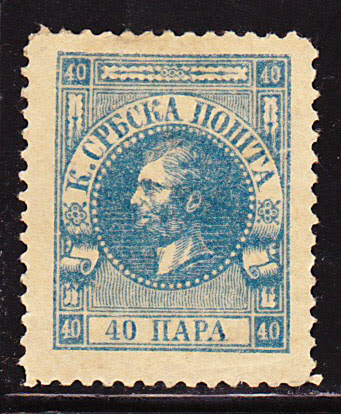 "SERBIA, All Diferent Older Stamps, Please see 2 scans"
"Add $1.00 shipping in the USA, $1.50 elsewhere, some issues have been reprinted and some facked, expect both, I can't tell, hence the low starting price, some with faults, please see 2 scans,"
I have long collected the classic era, 1840 to 1940, and these fit within that timeframe. 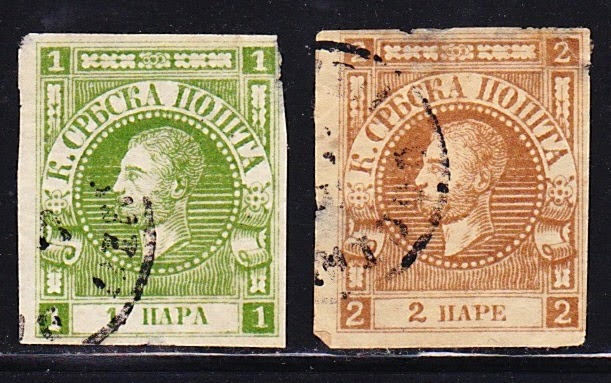 I have a smattering of the early Serbian stamps and when I saw this I thought it would be a good way to increase my collection. I didn't particularly care whether some or many of these were fakes or forgeries...to me that is interesting too. What I thought might be interesting for all of us is to look at these stamps together...I think the current terminology is "crowdsourcing"...to see if we could pool our knowledge or knowledge of online and hardcopy resources to see if we could determine, issue by issue, which stamps are fakes or forgeries and which stamps are the "real deal". I am hoping to enlist rayb in this scheme of mine, as well, as he seems to be the one most familiar with stamps from the Yugoslavia region. 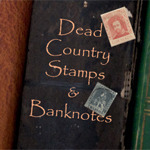 Note that I am using the Scott 2009 Classic Specialized Catalogue of Stamps & Covers, 1840-1940. I am going to go in rough chronological order and will start with the earliest stamps which are the Prince Michael (Obrenovich III) stamps issued between 1866 and 1869. There is a Vienna Printing, perf 12 and a Belgrade Printing, perf. 9 1/2 and pelure paper and finally an imperf printing on Ordinary Paper from 1868 to 1869. The above stamp that came with this lot seems to match the 40p ultramarine, Sc. no 6 or Sc. no. 13. The problem with the above example is the perforations gauge 11 1/4 all the way around whereas in the catalogue there are only the perf 12 and perf 9 1/2 varieties listed. The paper seems to be a normal paper type and not pelure. What do you all think? Fake or the real deal? Does anyone have any reason to think differently or know of other varieties of this stamp? That issue is ripe with fakes. Sorry, you have a forgery. The genuine stamp has 77 pearls in the circle. Assuming I counted correctly, your stamp only has 61 pearls. 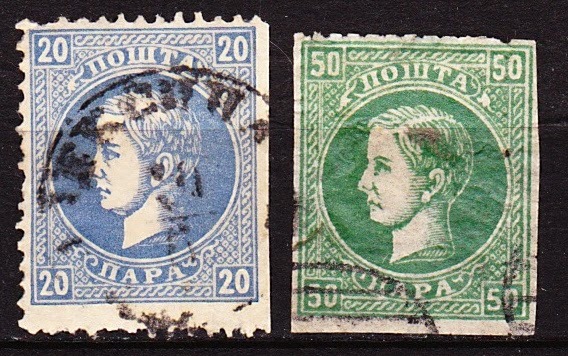 know of other varieties of this stamp? If you like to collect fakes, look for 59, 74, 80(, and now apparently also 61) pearls. I'm open to correction on this one, as I have not seen a fake with 61 pearls before. Of course, I haven't seen all the different fakes, either. All I know is that I was informed that the genuine Prince Michael stamps have 77 pearls. I am less concerned with whether the deathmask stamps (1st scan, 6th and 7th rows) are real than about whether the ghost story about them is true, and whether the deathmask effect was deliberate. I found this site which compares the 59 vs. 71 pearls stamps. I also counted 61. We will get to these soon...I am unfamiliar with the deathmask stamps and had not heard about this. Lets talk about this more when I get to these stamps and I post the scans. Butterflies, thanks for the posting the link. This is useful information for many I am sure. So it looks like the general consensus is that the above Prince Michael (Obrenovich III) stamp is a forgery. 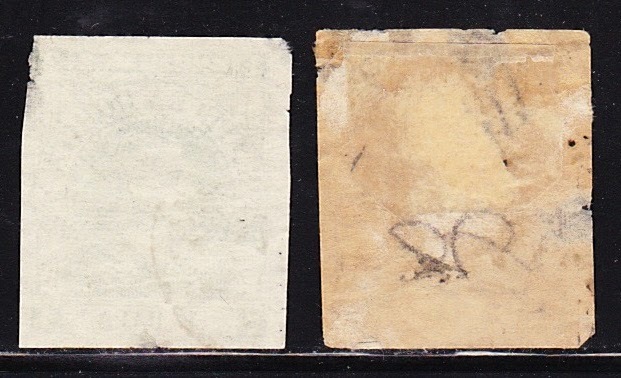 The next two look like they may be Scott 14 and 15, Prince Michael (Obrenovich III), issued in 1868-69, on Ordinary Paper and imperforate. 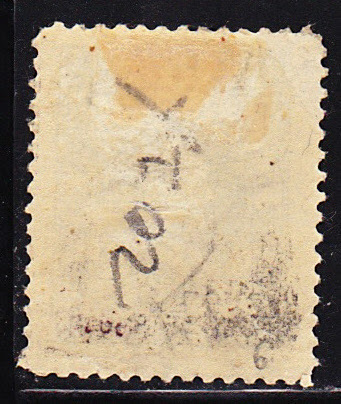 There is a note underneath the Scott listing for all of these stamps that counterfeits are common. I think we have kinda gathered that already. Actually the 1 para stamp looks very different from the image in my Scott catalogue (note the numerals). Although I don't know these stamps, both of them look quite dodgy to me. I can help with the German occupations (last half of page 2, beginning with the diagonal overprints). PostmasterGS, thank you. We will get there soon...I will be interested to see what you can tell us. Your 1p and 2p Prince Michael's are both forgeries. 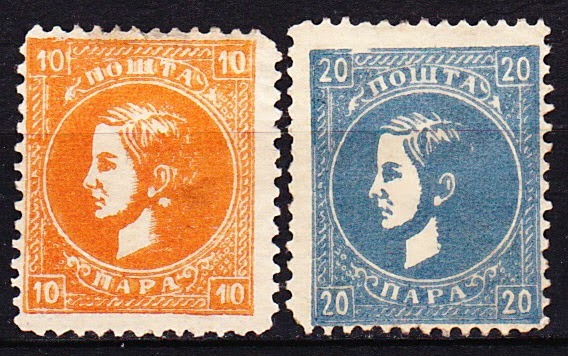 As mentioned before, the genuine stamps for this issue have 77 white pearls in the circle; also when printed clearly, there should be 16 white lines to the right of the portrait and 19 white lines to the left. Both your stamps meet the characteristics of the known forgery that has 59 white pearls and 16/17 whites lines to the right/left of the portrait. I think khj has pretty well summed that up. Let's move on to the Prince Milan stamps as below. I have divided them into 3 groups based on similarities. The first group is below. Both stamps are perf. 12. and would most likely be Sc. 18, 10p orange and Sc. 20, 20p gray blue or possibly 20a., 20p ultramarine. To my eyes, the lack of detail makes it pretty much a foregone conclusion that these are poorly made forgeries. Your thoughts? Any further information? The second group have much better detail and again gauge perf. 12 in the case of the 20p but in the case of the 50p the perfs are trimmed though you can still see a remnant at the top left. If these are the real deal they would be Sc. 20 or 20a and Sc. 24. What do you think?